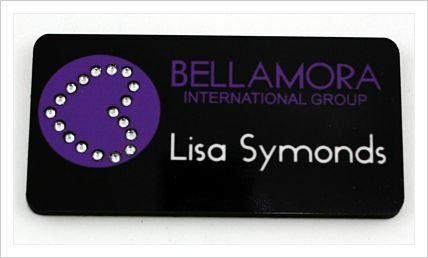 1.5"x3" WITH THE BELLAMORA HEART IN YOUR COLOR CHOICE OF RHINESTONES WITH A MAGNET BACK. Your company name or your name and title are entered below. If you have a custom logo for your company you can upload the file right below. Click add to cart to place order.